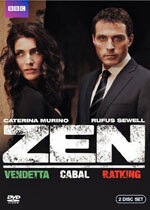 Zen: Mystery and Suspense on Television. Based on a character created by crime novelist Michael Dibdin, Zen stars Rufus Sewell as Italian police detective Aurelio Zen. The three episodes of the first (and possibly only) season are adapted from novels in the series.